One of the wedding gifts we received from family friends in Toronto was a gift card to a fancy china store downtown. I don't do china, but luckily, the store has a small "gourmet kitchen" section which is where I did my shopping during my most recent trip home a few months ago. After grabbing a blender and an electric corkscrew (which is awesome, by the way), there was just about $50 left...which turns out to be exactly the price of a 14-inch Emile Henry Flame Top Pizza Stone. I had never made pizza before, but I figured, hey, maybe if I got a pizza stone I'll start making pizzas! And making pizzas I did! For weeks I experimented with the perfect whole wheat thin crust pizza dough (because I like whole wheat, and I like thin crust), and even though I consulted the manufacturer's instructions manual as well as some tried-and-true recipes found online, many of my experiments failed: if it wasn't too oily, it was too dry, or didn't have the right whole-wheat-to-all-purpose-flour ratio, or didn't rise, or didn't bake through, or the base stuck to the stone. I learned the hard way that pizza doughs are finicky, finicky things, and even slight variations in flour brand, oven model, altitude, and room temperature can alter the result. So with that in mind, I share here my "perfect" recipe, with the understanding that this recipe works well for my specific pizza stone in my specific oven in my specific area (Pittsburgh) in a kitchen set to 74ºF. But, with a little experimenting, this basic recipe should work for anyone. The result is a pie that comes out crispy on the edges and the bottom and more bread-like inside. 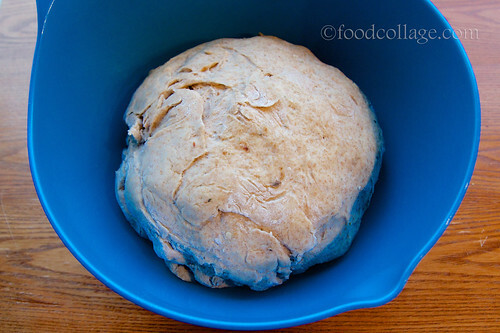 The dough also freezes well, and thaws in about a day in the refrigerator. In a large bowl, dissolve yeast and brown sugar in warm water and let sit for 10 minutes. 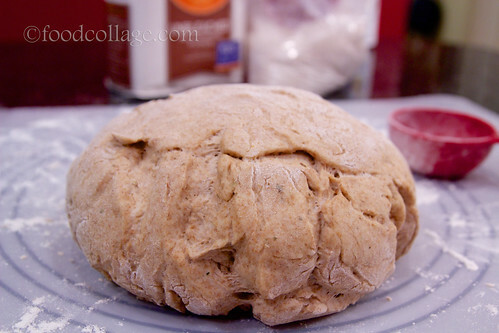 Stir the olive oil, salt, and Italian seasoning into the yeast mixture, then mix in all the whole wheat flour and 1 cup of the all-purpose flour until dough starts to come together. 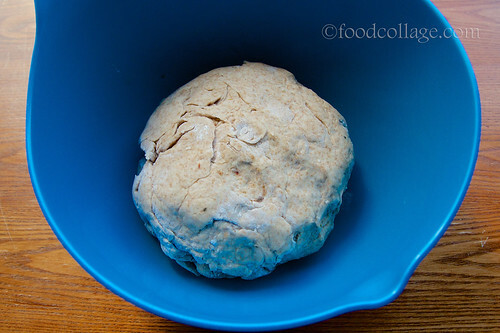 Tip dough out onto a surface floured with the remaining flour, and knead until all of the flour has been absorbed, and the ball of dough no longer sticks. Place dough in an oiled bowl, and turn to coat the surface. Cover loosely with a towel, and let stand in a warm place until doubled in size, about 45 minutes to 1 hour. When the dough is doubled, tip the dough out onto a lightly floured surface. Form into a tight ball. Let rise for about 30-45 minutes, until doubled. Cover and refrigerate dough overnight. 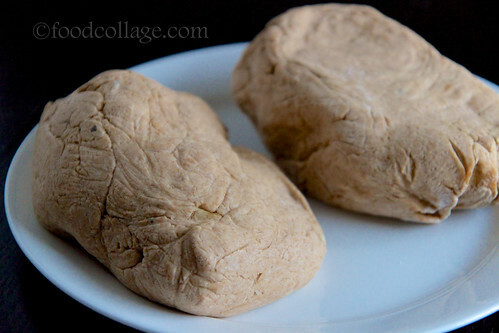 When ready to bake, remove dough from refrigerator and let sit about 15 minutes. Use only half the dough for a thin crust. Preheat the oven to 475ºF. 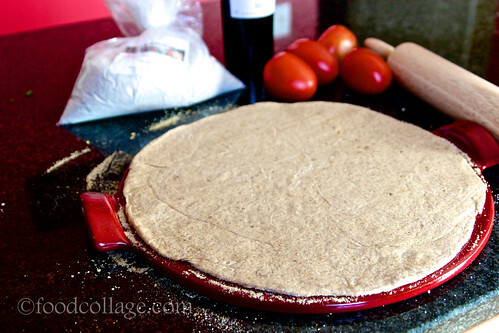 Sprinkle pizza stone with bread crumbs to keep pizza crust from sticking to it. (Note: This works well on my Emile Henry Flame Top Pizza Stone, which is meant for baking and serving directly on the stone. For many other stones, it is recommended that you place parchment paper between the dough and the pizza stone.) 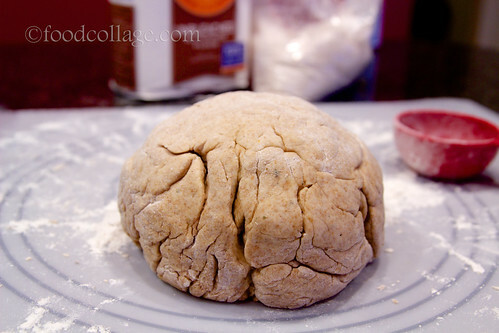 Form dough into a ball and flatten it. Gently stretch the dough and continue by rolling it with a rolling pin until the desired size, while gently pulling the edges outward. Add toppings, and bake for 15 minutes. Stay tuned for future posts on different pizza toppings I've been experimenting with! About 35 minutes later - the dough has risen!